"Sampath Speaking" - the thoughts of an Insurer from Thiruvallikkeni: Narendra Hirwani - that great debut at Chepauk... and Mihir's in his footsteps !! Narendra Hirwani - that great debut at Chepauk... and Mihir's in his footsteps !! Subash Gupte, VV Kumar, BS Chandrasekhar, MV Narasimha Rao, Laxman Sivaramakrishnan, Narendra Hirwani, Anil Kumble, Amit Mishra, Piyush Chawla………. 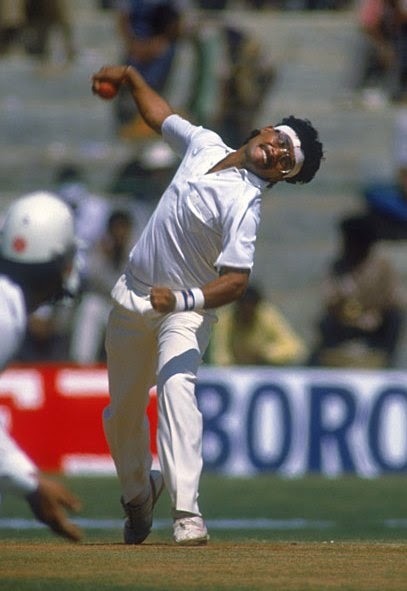 leg spinners – who played for India. Among them is the bespectacled man who took a record 16 wickets on his debut at Chepauk in 1988 – on that Pongal Test. For long – connoisseurs had the pleasure of seeing Pongal Tests at Chepauk – pitch for sure would assist spinners and surer still were the results. The famous Indian spinners would be virtually unplayable in the 4th innings. In 1975 Andy Roberts and Gundappa Viswanath shared honours in a match which India was to win by 100 runs (massive in those days); in 1979 it was a good performance of Kapil Dev as India beat Windies led by Kalicharra...... and in the twilight of Viv Richards – India led by Ravi Shastri (his only Test as Captain) had 3 debutants : WV Raman, Ajay Sharma and Hiru. Phil Simmons debuted for Windies. At Chepauk in Jan 1988 - India won an important toss, made 382. Hirwani took three of the five West Indian wickets to fall on the second day. On the third morning, Hirwani clean-bowled Vivian Richards with a googly went on to finish at 8 for 61; in the Second against a huge target of 416, Vivian Richard’s WI were dismissed in 40 overs. Hirwani was the wrecker-in-chief again with 8 for 75 and overall match figures of 16 for 136. Sadly, Chepuak was to become a batsmen’s paradise with hundreds and doubles flowing later…….. Though he started in the most exciting manner equalling Massie- an Australian - Robert Arnold Lockyer Massie despite that huge success in debut played in 6 Tests and 3 ODIs from 1972 to 1973. He took 16/137 at Lords. Hiru too could not match his great opening – some said he was too slow in the air to cause trouble, except on wickets which turned sharply. Strangely, inthe last league match of the 1991–92 World Series Cup. India needed to beat West Indies to qualify for the final. Hirwani played in that rather unexpectedly, had Brian Lara stumped off a flipper and Richie Richardson leg before wicket. Years later, he was to play a Test against New Zealand and took 6 for 59; toured England in 1996; in 2001 was in the squad when Aussies toured – remember Harbhajan was successful in that series. Read this interesting report in TOI of date - leg-spinner Mihir’s runup and loopy flight catch the attention of one and all at the Pachaiyappa’s College Grounds on Monday. It has uncanny similarities with one Narendra Hirwani, the world-record holder for the highest number of wickets on Test debut. It’s not a coincidence, though, that Mihir’s action is so similar to the stalwart; Hiru-bhai (as the senior Hirwani is known in the Indian cricket circle) is his father after all. Mihir, who is playing for United Friends Cricket Club (UFCC-T Nagar) in the VA Parthasarathy Memorial Trophy, has represented Madhya Pradesh in the U-16s, U-19s and U-25 categories so far. He also got a chance to train with the Mumbai Indians squad in the 2012 season. And it's evident from his performances in Chennai that he is improving. In his very first outing against Southern Railway Institute, Mihir took 4 for 21. In the match against Globe Trotters on Monday, Mihir returned with figures of 2-59. The youngster considers his father as his idol and shares a special bond with Chennai. ........ may Mihir grow to play Tests for India one day. Another reference to Narendra Hirwani is Test no. 1148 played at Lords in July 1990 – Gooch, captained, won the toss and made a marathon 333 in 485 balls. Alan Lamb and Robin Smith, both of South African origin made centuries too as England declared after making massive 653 for 4 against the Indian bowling attack of Kapil, Manoj Prabhakar, Sanjeev Sharma, Ravi Shastri and Narendra Hirwani. India had a good start; Ravi Shastri made a 100; Vengsarkar 52 and the captain Azharuddin 121. when 9thwicket of Sanjeev Sharma fell, it was 430, still a good 23 short of avoiding a follow-on. Kapil was joined by the spectacled Narendra Hirwani. Eddie Hemmings, the off spinner was the bowler – the first 2 deliveries were innocuously played by Kapil. then came the savage attack – all the 4 remaining deliveries went for huge sixers. The fourth one, a straight six saved the follow-on and to end the drama, Hirwani was out to the first ball at the other end lbw to Angus Fraser – India All out for 454.